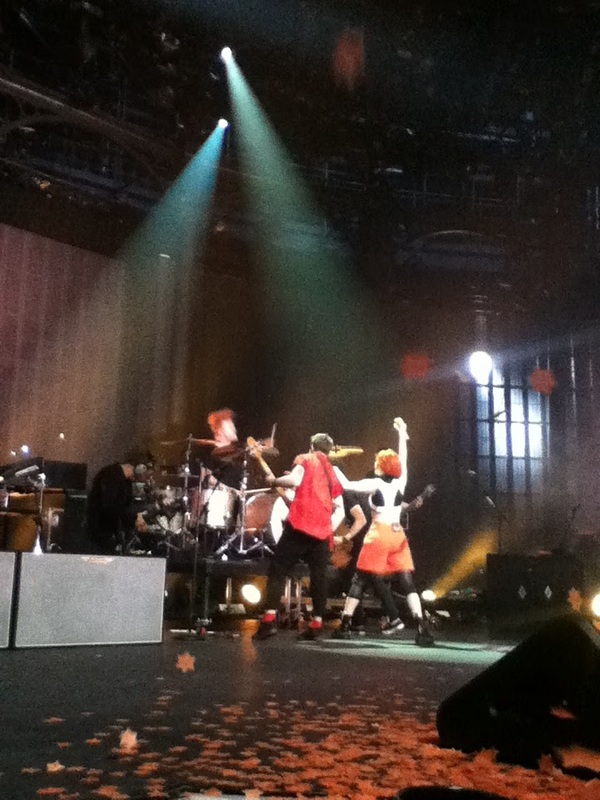 Kirstiekins Blogs: iTunes festival: Paramore! Tennessee rockers Paramore took the iTunes festival by storm on Tuesday night at the infamous Camden roundhouse! Out of the thousands of competition entry's, only a handful were selected to attended the small gig, that was televised for the world to see! Although I initially didn't win tickets, I put my heart and soul into getting into the venue to see my favourite band play such an intimate show! After almost 6 hours of waiting in the standby queue, a kind human from the main queue asked if I was on my own, and if so I could have her spare ticket! Automatically I started screaming and crying, but who wouldn't if they were finally getting to see the band they have loved since the age of 14 play an event tens of thousands had applied for, that only 5000 managed to get into! 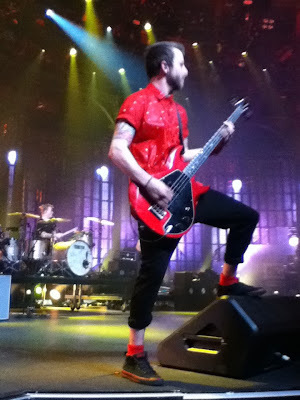 However, not only did I make it into the venue, but I made it to the front, on the barrier, where I had the best view of Hayley, Jeremy and Taylor! The one of a kind support band French Soler of whose style I can only describe as electronic bongo rock blew everyone away with their unique style and left the crowd hyped for Paramore's hour and a half set! To me, their is no greater feeling, than standing with 5000 squished up people all waiting for that one moment when the house lights go down, the stage lights go up and the band you have been waiting all day to see are on stage ready to rock your socks off! Bursting onto the stage with Fast in my Car the band played 18 more of their iconic songs, from their from their four albums (AWKIF, Riot, Brand New Eyes, and Paramore) and for me, aside from the fact that they did not play Hallelujah, the setlist was perfect! So what was the setlist!? The band then returned on stage after a copious amount of cheers and screams from the hyped crowd, begging for 'one more song'! They broke out into Part II the second part of their iconic song 'let the flames begin' from the RIOT album, followed by Moving on, and finally ending on their latest single Still into You, leaving an electric buzz throughout the whole venue, having everyone wish it could have lasted forever! Hayley Williams, owned the stage throughout the whole night jumping and spinning to music, her fellow band members created! She stood on the edge of the stage, for the world to see and declared that "In case you don't know...WE. ARE. PAAARAAAAMORE" a phrase she conned when the band were becoming a growing force within the rock community! 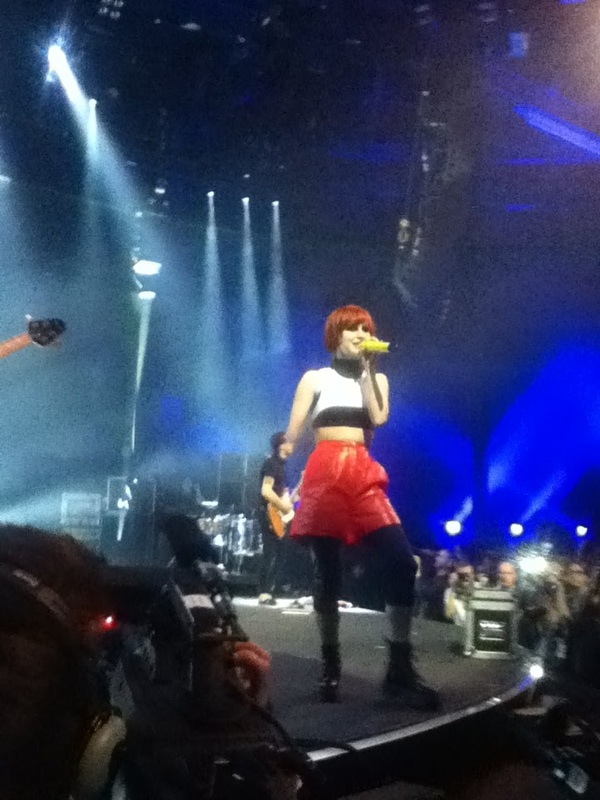 After being a fan for such a long time, it was a dream come true, when Hayley looked, pointed, smiled and got down in front of me, as well as having Jeremy poke his tongue out, and synchronise head bang with me during Decode and CrushCrushCrush! Hayley then spoke about how the band had been through a lot over the past few years (obviously meaning the departure of ex members Josh and Zac Farro, and figuring out their places in the world - growing up etc..) and said that if they can get through that, then we can get through anything! The trio then performed 'Last Hope' from their recent studio album. Orange stars rained down through out their last song, as the band came together at centre stage for the last time that night! Closing the show with Still into You, Paramore had the audience in the palms of their hands!As the crowds cleared, the arena saw the after affects of Paramore's roof raising show! 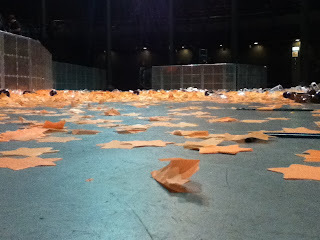 The orange stars were trampled into the ground, along with plastic cups and broken beer bottles! Leaving me with a solemnfeeling in the pit of my stomach! The event I had been waiting for all day, had been and gone, leaving me with nothing but memories! However I wouldn't have had it any other way, the adrenaline and excitement I felt that night, was an amazing experience that I would not trade in for the world! The show was streamed live to the world, via iTunes, however if you missed it you will be able to watch it on channel 4 sometime this month, or if you can't wait you can follow this link! Paramore are currently touring Europe, and you can buy tickets to your local shows via the ticketmaster website!